Two & three year olds are beginning to develop more sophisticated language skills. They are learning to express themselves and they love it! We continue to model positive communication skills and self-expression (something our two year olds are naturally good at!). Soon we will begin to add elements of positive conflict resolution, which will help children build self-esteem and learn to use peaceful modes of communication in problem solving and conflicts. Our teachers are enthusiastic, experienced and continuously trained. They are kind and nurturing. 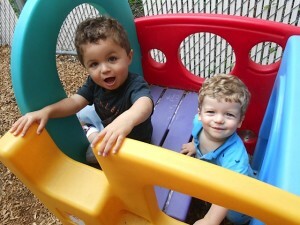 Our approach is primarily developmental, stressing social skills, exploration, discovery, independence, and creativity. 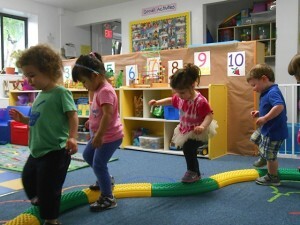 Our preschool rooms are bright and sunny, and beautifully equipped. Your child’s days will be filled with rich experiences in the arts, dramatic play, nature, numbers and language. At this age fun things like costumes, puzzles and tricycles become part of your child’s everyday life. 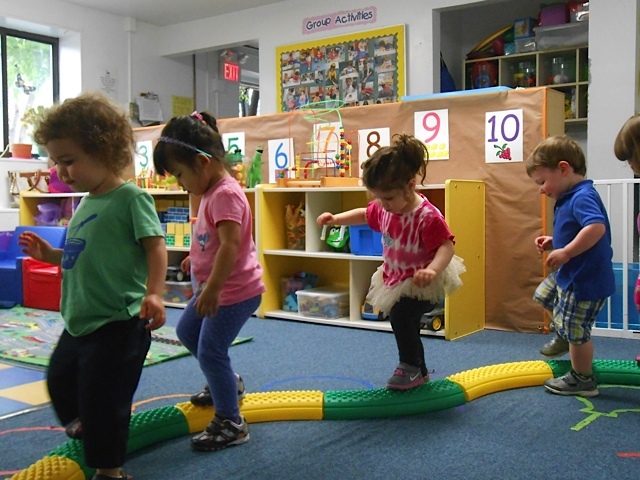 Special teachers visit the classrooms regularly to present activities and experiences in music & movement, sports & fitness, and foreign language exposure. Our well-balanced curriculum encourages lots of active and imaginative free play. Active play is at the heart of children’s learning. At this age your child may or may not begin to show interest in potty training. Some children begin to show interest and then forget about it completely for extended periods. Whether a child is two, three or older, our experienced caregivers are there to provide positive encouragement and support to the children (and their parents!) as they navigate the transition to a diaper free life!